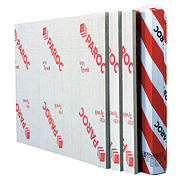 Wind protection slab PAROC WPS 3n is non-combustible stone wool insulation with an integrated wind tight facing for existing and new well-ventilated external walls. The wind protection insulation slab can be used as an external layer of two layer-systems in combination with another thermal insulation layer. With a two-layer system you can create a continuous thermal insulation layer with staggered joints to improve the thermal performance of the wall. The wind protection slab is faced with a vapour permeable, windproof Tyvek® membrane which creates an excellent barrier against the weather. Good vapour permeability allows possible moisture to dry safely without causing condensation problems inside the construction. The joints should be sealed with a special tape in order to minimise air leakage. Fire classification is A2-s1, d0 when the Tyvek is on the back side of the product.